"This colorful and elegant side dish is so easy to make. I love making this with beets and shallots straight from our local farmers' market. Green onions or chives may be substituted for the shallot if you prefer." Preheat oven to 400 degrees F (200 degrees C). Wrap each beet individually in aluminum foil, and place onto a baking sheet. Bake beets in preheated oven until easily pierced with a fork, 45 minutes to 1 hour. Once done, remove from oven, and allow to cool until you can handle them. Peel beets, and cut into 1/4 inch slices. While the beets are roasting, whisk together shallot, parsley, olive oil, balsamic vinegar, and red wine vinegar in a bowl until blended; season to taste with salt and pepper, and set aside. 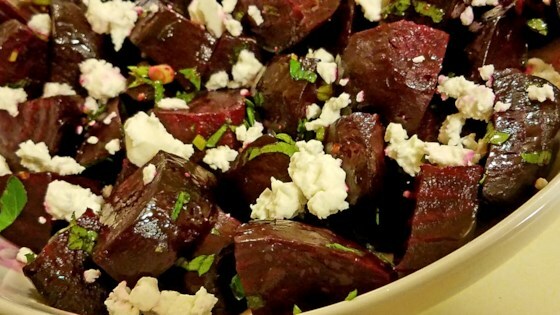 To assemble the dish, place the warm, sliced beets onto a serving dish, pour vinaigrette over the beets, and sprinkle with feta cheese before serving. This simple salad will turn beet skeptics into full-on beet lovers. really great and easy. I was short on time so microwaved the beets instead (10 minutes on high). Thank you! I think I just don't like beets. I followed the instructions... and I found a recipe b/c I decided to grow them in my garden, but I wasn't a huge fan. I may just not be a beet-liker. made as written--used green onions instead of shallots. it was not only tasty, but has a great presentation. thanks! i've also seen versions with pine nuts and/or arugula.